I'll take 5 of the South African coins, too! I'd like to order a few myself. Are you taking orders yet? and if so how can we order some? For those I made trades with, your GA coins were mailed out Monday in padded mailers. You should receive them any time. Obviously the folks on the West Coast will take a few days. I have 4 additional GA Coins to trade for any "personal" or "signature item coins" I don't yet have. I only have: Nurse Dave, Conejo and Ray & Rose. So I'm open to trade for any other personal coins. Yeah... what other people said.. I'd take 5. Can I assume that by watching this thread, we'll soon find out when/if we can order a few? I too would love a couple of the South Africian coins! Please keep us informed on when to order. Thanks! Something I offered to the UK coin people and I'll offer to you; If it's possible to split the shipment since you'll have a decent nubmer going to the US, I'd be happy to recieve and send out the US orders. That would avoid customs on part of it and two way shipping costs. Yeah, I know you can just buy these, but trading is more fun - right? OK - its been confirmed... finally. The 2005 edition Texas coins will be on sale at the Texas Challenge next weekend. So, if you're in the Dallas area you're in luck! We've ordered 500 so there should be plenty to go around. I'll post a link to the web site where you can purchase them next Sunday. 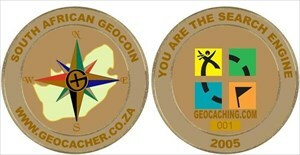 The coins will be trackable on our web site! Wheeee! I have a GOWT coin I will trade for a Ga coin. I would also trade for a 2004 or 2005 USA Geocoin. To add to another post, any trade you do with worker of wood is well worth the trade. His wand is awesome looking!!!! Just got my Idaho geocoins in, and I have one extra I'd be willing to trade for a georgia geocoin. The only problem is is that the idaho coin has my geocaching name on it, so I'd be willing to haggle out a deal with anyone interested in a trade. Well, I had a trade arranged for a GA coin, but I can't remember who with... So, I still need one (or 2, or 3), and will trade a wand to anyone interested. I'm also looking for some of the newer personal coins and wooden nickels. I have a new token to offer in trade (see my profile page), and they are trackable. Just a quick note of thanks to the people I've set up trades with so far. I still have a few trades up in the air right now, but I have completed trades with Nurse Dave and Team Nazgul. In both cases the coins were in the mail quickly and packaged carefully. Snail mail took a while from one coast to the other, but the coins arrived in great shape. I would recommend trades with either of these members. Thanks again to everyone who who has traded (and are setting up trades) with me. I appreciate your help in getting my sig item collection to grow. Well, I couldn't think of any other word that was more easily twisted by others in the forums. I knew it was only a matter of time before somone jumped on it. Thanks again for the trade, Dave. Whoa, got a ton of offers on my Idaho coin. Wish I had more of them to trade, but seeing as I only ordered a few, I can only trade one, and it is now spoken for. Thanks for all the responses! I have a GOWT coin I will trade for an Idaho. Anyone.....please......anyone. Rather than adding another post here every time I update my trade list, I've created a web page that I will keep current. Please check it out if you're interested in trades. Anyone want to trade an Idaho geocoin for the PA coin I need??? I now have The New 2005 Texas coins for trade... If interested please email me. First come first served!! Back on the 1st page, it was mentioed about trading signature items like wooden nickels...did i miss where it went off to, or did it die a neglected death? Just sent you an email about a trade for a Georgia coin. Just sent you an e-mail about an Idaho for Michigan coin. Thanks a million Grandpa Rocks & Grouchy Gramma! That is two for two today. Looking to trade a Texas 2005 for a Mich. coin.. Anyone intersted? I'm looking for an Idaho, California and Pennsylvania geocoins I have Georgia geocoins to trade for them. Thanks in advance! Email me if you have something I don't and want something I have. I have 4 or 5 new Idaho geocoins with the etching Night Stalker on them which I would be willing to trade for some other state coins. If anyone is interested send me an email. I am currently out of town working but will be back in town on the 24th. You're welcome, and thank you for the great trade. Now if I can only get one of those cool Idaho coins. So my collection is quite small. Ideally, I would like to expand it with these 10 "trader" coins (I also have a couple extra Canada coins, but I think you can still buy these pretty easily). I am also open to trades of 2:1 or 1:2 or whatever. Like most people, I really want a Moun10Bike coin, so if you have an extra let me know what you would want for it. I don't pick these up until April 2nd -- so be aware of that as well for timing. Kiltsurfer, I sent you an email about an extra coin I have that's not on your list. If anyone has anything that I don't have, let's deal... I know it's a long shot for most of the ones I need, but you never know. I was able to find some of the rare ones with little trouble. For trade I have my personal coins, Washington, Oregon, California, West Tennessee, North Carolina, Michigan, Pennsylvania, Kentucky, Idaho (not engraved), Alabama, and Missouri. None of my personal coins are for sale, but I will consider all serious trade requests. My coins cost me more than the average geocoin so I usually don't make trades for coins I can buy. I also collect trade tokens from Grants Pass, OR... needless to say that for finding me tokens I don't have I wouldn't mind giving one of my geocoins as a finders prize. For the right token I'd give more... its worth keeping an eye out for. Washington, Oregon, California, West Tennessee, North Carolina, CKayaks, Idaho, Kentucky, Missouri, Texas 2003, Texas 2005. I'm not familiar with the KOIC coin. Does anyone have a photo?